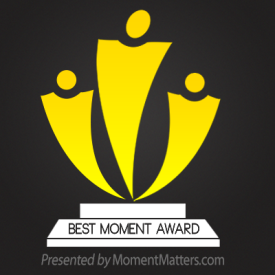 Thank you Sameer for nominating me for the “Best Moment Award”. Congratulations everyone,grab your badges and display it on your side bar. Pick five other bloggers from your list to nominate for the,”Best Moment Award”.Kindly do it within a week.Thank you all. How nice it is to see my blog mentioned here. Thank you! You are welcome,display the award on your sidebar and nominate five other bloggers of your choice and inform them.